I led, defined, and designed the user and brand value pitch for a partnership with 500px, a leading photography community site. 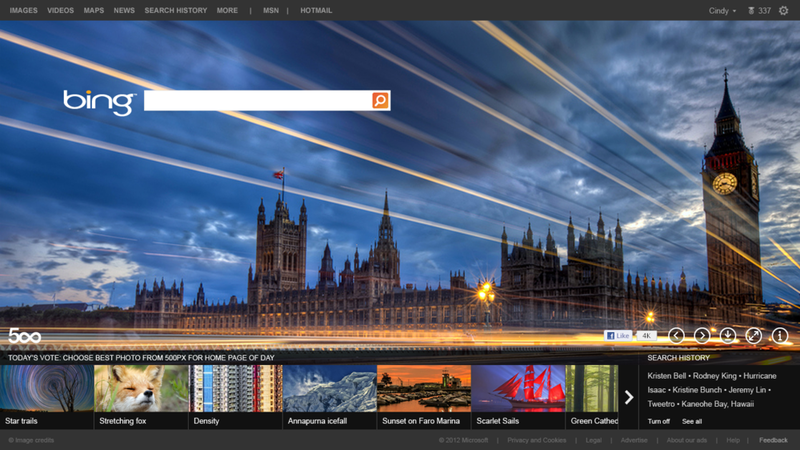 The partnership resulted in Bing's Homepage of the Day, an opportunity for photographers to have their photo be featured on Bing's landing page, viewed by millions daily. It was one of many concepts I created to win the partnership. An executive wanted to collaborate with photography startup site, 500px. He approached my design lead and me and gave us a one-liner: "What would Bing look like with 500px content?" I had less than 1 week to deliver. Define the concepts for user experience and differentiation value. Created competitive analysis to detect strengths. Conceptualized the creation and adoption of 500px content and its user value across Bing features through walk-throughs, prototypes, and hi-fidelity mockups. Gain leadership buy-in (at both Bing and 500px) by representing user experience team during partnership negotiations. Left: White-boarding and mapping brainstormed feature concepts to execution roadmap; what we could pull off from near to midterm to future. Right: Visualized virtuous feedback loop for 500px content creators for how exposure on Bing would lead to more discovery/engagement with Bing users back to 500px. Find symmetry in aligning 500px's business and user goals with our own and underscore Bing as a showcase for aspirational photographers, aka 500px users. Identified how 500px marketed itself among its competitors and users. Interviewed stakeholders for business goals. Strategized and identified how to create value for 500px's community of photographers and their photography while highlighting why Bing was the best platform for their work. Brainstormed, designed and pitched 5 different concepts across Bing and Microsoft properties to 500px founders. Bing landed the 500px partnership deal, further solidifying its dominance in image content and presentation. Out of the 5 concepts, we shipped the editorial homepage contest in collaboration with 500px. Prototype of how users could interact with Bing's 500px Homepage Image of the Day Contest – from perusing entries to voting for their favorite to sharing their voted entry on Facebook.